Joseph W. Koterski, S.J., is an American Jesuit philosopher who teaches at Fordham University in New York and serves as editor-in-chief of International Philosophical Quarterly. 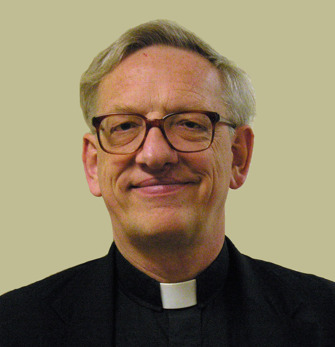 He recently finished serving two terms as the president of the Fellowship of Catholic Scholars. His publications include the monograph “Introduction to Medieval Philosophy: Some Basic Concepts” (2009) and he has produced several lecture courses for The Teaching Company: "Aristotle's Ethics," "Natural Law and Human Nature," and most recently "Biblical Wisdom Literature." Father Koterski holds an H.A.B. degree in classical languages from Xavier University in Cincinnati as well as an M.A. and Ph.D in philosophy from St. Louis University. He also holds an M.Div and S.T.L. from the Weston Jesuit School of Theology in Cambridge, Mass. He specializes in metaphysics, ethics and the history of medieval philosophy. On Aug. 24, I interviewed Father Koterski by email about the state of Catholic philosophy in the United States today. As editor in chief of International Philosophical Quarterly, you see a lot of current research and writing. How would you characterize the current state of academic philosophy? To judge from many of the manuscripts that come to IPQ, there is much solid work going on in professional philosophy. Some of the submissions that I see concern perennial philosophical problems, some consider textual problems and some deal with the history of philosophy. There are, however, some worrisome trends. Some of the manuscripts that I receive want to treat contemporary issues directly and show almost no acquaintance with the history of philosophy. My suspicion is that this may be the result of the way in which some graduate programs operate, but such historical amnesia is as unfortunate in philosophy as in any other area: there is danger of simply repeating past mistakes without having learned from experience. Another worry is over-specialization: it is not uncommon to receive manuscripts with little to no sense of things that are relevant to the problem under study but that are outside the formal parameters of the author’s training. It always helps to read broadly, to read in foreign languages and to read outside the area of one’s own formal training. As the post-college U.S. job market continues to tighten, we seem to be seeing a drop-off in the number of humanities majors—particularly philosophy—and rise in STEM majors. Why should undergraduates or graduate students study philosophy in a world that won’t pay them for it? I, for one, do not bemoan the rise in STEM majors. These disciplines require more rigorous thinking than tends to be found in some of the humanities and the social sciences. What is of more concern to me is whether those in the STEM majors are only studying disciplines that emphasize quantitative reasoning. The problem that threatens there is whether a person with such a one-sided education will have had enough education in regard to history, literature, ethics, political philosophy and other such studies that they need for personal development and for appreciation of the common good. Much as I would like to promote the choice of one of the humanities for a college major, I need here to make some distinctions. (1) There are humanities and there are humanities: I see little point in concentrating one’s undergraduate studies in such things as are dominated by postmodernism and deconstructionism. It would, however, be much worth one’s time and resources if, say, the literature program is focused on traditional classics, and if the philosophy major would give one sound tools for thinking and a deep acquaintance with the traditional texts of perennial philosophy. (2) While lauding good rigorous majors in the STEM disciplines, I would argue that such students need a rigorous core curriculum all the more so, lest they miss getting an undergraduate education that will serve them beyond what technical training provides. Some academics today, particularly those from a math and science background, view philosophy as a primitive form of science that no longer has anything important to say. How would you answer that claim? I suspect that a person who holds this view misunderstands philosophy as one more specialized discipline among others, and an outdated one at that insofar as it does not use an empirical method like the methods familiar from most scientific and technological fields. But that is not what philosophy is. Without trying to include here all the highly specialized parts of this field, let me confine my answer to the three content-spheres of philosophy that have most to do with education: logic, being and values. (1) Logic: this is the art of good reasoning; it is often taught by the philosophy department, but it is not content-specific. It remains crucial for good thinking in every field and in all of life. (2) Being: in philosophy this tends to be treated in metaphysics, in the philosophy of nature and in other such courses that deal with the various types of being and with God as the source and goal. People need the time and place to think about questions such as whether there is a God and what implications flow from the answer to that question. Among the most important books that I have read in recent years is a book by Robert J. Spitzer, S.J., on the use of current astrophysics to prove the existence of God. (3) Values: many people today simply assume a version of utilitarianism as their ethical position, despite the inhumane decisions to which such a position regularly leads. In my view, real ethics invariably respects the uniqueness of human persons, and from the irreducibility of the value of persons to the mere calculation of benefits and burdens a real ethics can have incredibly important things to say on any number of topics. How do you define philosophy? Taken broadly, philosophy is (as its etymology suggests) the love of wisdom. More specifically, it is the habit of mind that seeks to understand by disciplined inquiry everything that is able to be known by reason. In contrast to the vast variety of specialized disciplines, which are restricted to one or another kind of thing as their subject-matter or restricted by the specific methods that they use to investigate their proper subject-matter, philosophy is universal in the scope of its concerns. In this way, one can speak of a philosophy of human nature and a philosophy of biology, political philosophy or a philosophy of technology, a general philosophy of being and of philosophical ethics, and so on. What contributions can philosophers make to our world today? There is no limit to the possibilities here, but let me mention some examples. I find that there are many tendencies to reduce human life to “just one more thing” in the world, and then a readiness to treat human beings as mere commodities. It seems to me that a sound philosophical approach to the question can provide reliable reasons for holding that human beings (notwithstanding the many things that we share with other animals) are distinctive in kind and not just different in degree. In turn, recognizing this difference in kind provides the justification for saying that there are ethical principles that are normative always and everywhere with regard to how human beings need to be treated. Understanding this will make a considerable difference in economics and politics, in biological and medical research, and so on. Is there such a thing as “Catholic philosophy,” and, if so, what is it? Let me offer two points here. (1) In the long history of discussion about the relation of faith and reason, it seems clear that divine faith (in the sense of God’s gift of light, wisdom and knowledge) has illuminated some truths that human reason alone had difficulty in seeing. In this sense, I think that there is a distinctively Catholic philosophy, namely, a philosophy that is willing to learn about these truths and then to work on them by proper philosophical tools (the principles of good reasoning). To have the help of divine light as a way to see and focus on certain truths does not remove the need for the disciplined use of properly philosophical methodology. (2) There are certain themes and areas where Catholic thinkers have used philosophical insights very profoundly in correlation with concerns that are important to the church. The modern tradition of Catholic Social Teaching, for instance, tends to employ much philosophical argumentation in addition to whatever arguments are made from Scripture and tradition. Here the reason for doing so seems to be, in large part, that those to whom the documents of Catholic Social Teaching are addressed do not necessarily share the same religious commitments or the same assumptions about divine revelation. The CST principles of subsidiarity and solidarity, for instance, are principles that anyone could, at least in principle, know without the benefit of revelation. But their articulation has tended to come in documents of ecclesial origin (encyclicals, conciliar documents). Insofar as the warrant for these documents is not revelation, their cogency must be shown by philosophical means. But the recurrent connection between these principles and their ecclesial use does contribute to thinking about them as a kind of Catholic philosophy. As a Catholic and as a Jesuit, is there anything distinctive about your own approach to teaching philosophy? I regularly teach courses in ethics. As a Catholic and as a Jesuit, I want to be straightforward in laying out my cards and in using the methods that are appropriate to the subject. Happily, in a classroom setting, it is easily possible to make clear distinctions and to put things into perspective by comparison and contrast. So, for example, in ethics, I try to stress the need for sound principles of ethical reasoning and to reflect on the sources by which we know these principles. In many cases, it seems to me to be possible to locate the source of a principle such as the inviolability of innocent human life in more than one way—in revelation and in sound reasoning about the nature of the human being. In my teaching I work throughout a semester at bringing students back again and again to questions like these: What are the basic principles? How do they apply? How do we know them as normative? How do we check on the accuracy of their applications? In this way, I think that I can maintain the integrity of the discipline of philosophy, and I can also give witness to my Catholic commitments as a Jesuit priest in the way that I undertake the courses that I teach. What inspired you to become a philosopher? In the first place, I would give credit to one of my teachers in college: Professor Richard Bonvillain at Xavier University. In each of the many courses that I took with him, I saw a professor who insisted on us clarifying the nature of the problem under discussion, seeing all the relevant sides of the issue, giving the best defense that we could even of positions with which we disagreed and then trying to resolve the matter by the best reasoning that we could muster. He taught us very well the need for clear and unambiguous definition of terms, the need to have true propositions that were really related to the question under discussion and the need for cogent reasoning with due attention to the justification for our claims. In his classes he gave us in his own practice a splendid model for that sort of academic conduct. I very much wanted to imitate him, so I went to graduate school at St. Louis University in order to receive professional training. There I met some additional professors who were very inspiring: especially Professor James Collins (a great historian of modern European philosopher, with whom I eventually wrote a dissertation on Karl Jaspers) and Professor Richard Blackwell (one of the greatest teachers that I ever had and on whose classroom procedure I have tried to model my own). Your students include Jesuit scholastics and diocesan seminarians, but some theologians have criticized Catholicism’s reliance on Greek and Roman thought, calling for more social sciences and less philosophy in seminary curriculum. In your view, how does philosophy contribute to priestly formation and relate to theological training? I do not see why greater attention to what is sound and reliable in the social sciences requires less attention to what is sound and reliable in the tradition of philosophy. In fact, I fail to see how one could distinguish between what is sound and what is unsound in any other discipline (including all the social sciences) without considerable attention to such skills as logic and such knowledge as is gained by considerations of human nature, metaphysics, ethics and political philosophy. It seems to me that there is much good social science, but also much that is little more than ideology and partisan politics. I am currently working on a book on the use of philosophical principles in Catholic social teaching. A greater love for God, a greater desire for union with Jesus Christ, a greater respect for the teachings of the church and a greater ability to reason in a sound way as a grateful response to God’s gift to us of the power of reasoning. Thank you, Sean Salai, for interviewing this good priest, gentleman and scholar. Father Koterski's response to your final question is breath-taking: "What do you want people to take away from your life and work?" -- "A greater love for God, a greater desire for union with Jesus Christ, a greater respect for the teachings of the church and a greater ability to reason in a sound way as a grateful response to God’s gift to us of the power of reasoning." Another excellent Interview. On the importance of philosophy, I believe that since philosophy is the foundation of all reasoning, one cannot really be educated if one is not educated in philosophy to some degree. One can be a good technician in a STEM subject or car mechanics or literature and still not be educated, if one cannot think straight. Those who decry or deny metaphysics are just doing bad metaphysics, as it is so central to reasoning it cannot be avoided. Some of these critics can be very advanced in their specialty and still make very basic mistakes. A couple of contemporary examples are Richard Dawkins' claim that, if a God existed, He would have to be an evolved complex being; or Larry Krauss's understanding of "Nothing" (a whole book of hilarious misunderstandings). Great interview. I first discovered Fr. Koterski when I took his Teaching Company course on Natural Law. http://www.thegreatcourses.com/courses/natural-law-and-human-nature.html I highly recommend his course on a topic that is very relevant in today's conversation. Thanks everyone for reading. Let's continue to pray for one another.